Shea Moisture just released a new product specifically for locs, but the question is— Is this a good or bad thing? 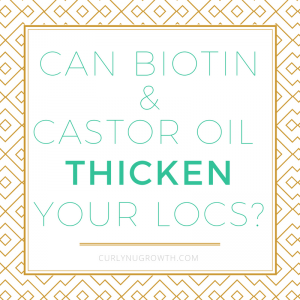 With my Sisterlocks and my current set of Traditional Locs, I have used several products in experiments to see how they will perform on locs— and most have failed. The use of Shea Moisture products was no exception to these trials and they were included in my rant on “Why Does Everyone Hate Locs“. Well, I think they must have heard me. Internationally, Shea Moisture is associated with creating products for every hair care need under-the-sun and making it easy for consumers to pick and choose what they need. Specifically though, the target audience for Shea Moisture products are loose natural hair women or those that are transitioning away from relaxers. Despite not being part of their target demographic, I was so excited to get my hands on the new Strengthen & Grow line. 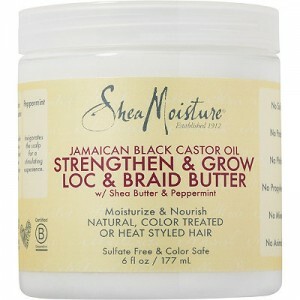 Now, they have added to the Strengthen & Grow collection with the “Loc & Braid Butter”. Yikes!— this is a bad thing. To explain why that the Shea Moisture “Loc & Braid Butter” is a bad thing for the loc’d community, I want to share a little story with you. Rewind back to when my locs were entering into the teenage phase— finally starting to loc and staying together but ever so rebellious and out of control. During this stage, for months, I swore by the Shea Moisture JBCO & ACV Shampoo for my locs. Literally, I was at CVS faithfully when my bottle was almost out because it made my locs feel soft, hydrated, and clean. Then, after trying a different shampoo, my locs felt soft, hydrated, clean AND lighter. What I then learned changed my whole perspective on hair care products for Locs. I speak through experience when I say, you should NOT use shea butter on your locs or any butter-based product for that matter. I go into detail in a past post—” Why I Stopped Using Shea Butter“, but to sum it up, it will cause build up. Before you smack your lips and disagree with me, hear me out. Maybe not tomorrow, or next month, but eventually you will have build up in your locs from using butter-based products, it’s inevitable. Many formally trained locticians will agree with this. Often times, we get clients that swear they have zero build up and it doesn’t appear until we shampoo their locs. Loctician & Product Developer, Chimere, of Dr.Locs explained it best by saying, “you don’t notice the build up in your locs because you don’t shampoo your hair with a mirror”. By the time you are looking in the mirror the build up has retreated back to the center of your locs, not to be seen until the next thorough cleansing. 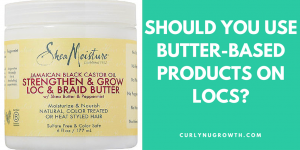 Now, don’t get me wrong— I think it’s great that a internationally acclaimed hair care brand like Shea Moisture has begun to expand their targeted audience to reach the loc’d community; however fundamentally “butters” should not be used on locs. 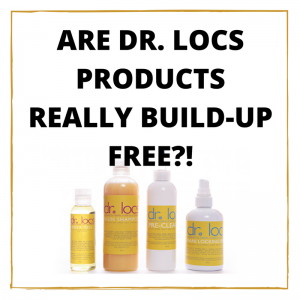 I understand there are many philosophies on locs which entitles you to choose your products based on your lifestyle. I’m just saying, no shade. 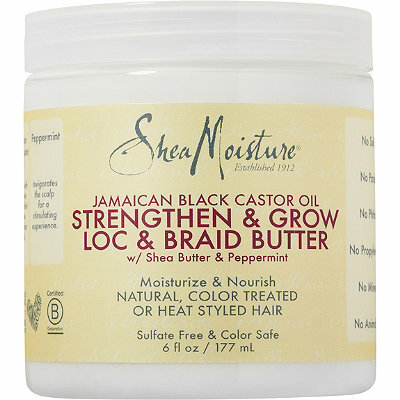 Have you tried the Shea Moisture Loc & Braid Butter? If so, share your experience in the comments! I just purchased the Shea Moisture Loc and Braid Butter…I also purchased the Jamaican Black Castor Oil shampoo …the shampoo works great! The butter after opening the first words that came to mind was “build up” it seems to thick to me to use for routine loc palm rolling maintenance…I decided just to place a nice dime size amount in the palm of my hand and rubbed it in and evenly distributed throughout the my baby locs. I continued to use my Jamaican Mango Lime For Palm rolling. My hair turned out very nice and smelled great. so I would only use the butter as moisturizer but not for a routine product when doing my loc maintenance. I would be very careful with using Jamaican Mango and Lime, their gel definitely cause buildup (check out this review) and as it relates to the Shea Moisture Shampoo, I know how great your locs feel and smell (it was my favorite shampoo for a while) but just be sure to thoroughly rinse your locs afterwards or build up with ensure. Just sharing some personal tips 🙂 and I appreciate you sharing your experience! My locs are fairly “new” – under 2 years old, and I started them with added human hair. I also color them, so I’m always on the lookout for moisturizing products, as I want to keep the length I added and what has grown since. I loved the Shea Moisture line when I was a loose natural, but now I only use the shampoo and conditioner. 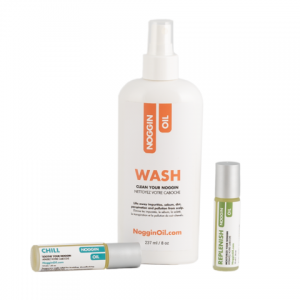 Thank you for the review – I had seen this product and thought about trying it, but I’m glad I read this review first. So, I stay away from Shea Moisture hair products since I bought their moisture retention shampoo. OMG, my locs felt like it was coated with something icky. It took 4 washes to get that gunk out my hair. Since then, I realized that not all natura hair care products is made for locs. I learned the hard way too! Thank you for sharing your experience and I am glad that you learned your lesson!